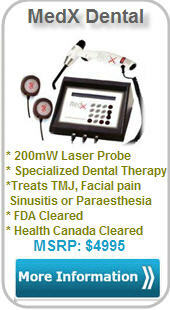 Dental lasers in both console operated and portable units. The MedX console and MedXHome both include SLD (Super Luminous Diode) emitters for treating large areas. These products are produced in Mississauga, Ontario and are both FDA cleared and Canada Health Licensed, so they typically qualify for medical reimbursements in Canada. 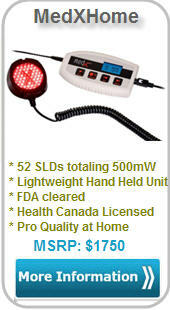 There are a number of benefits to using MedX Photo therapy rather than other electro modalities. It is more efficient because there are no messy conduction mediums and time consuming setups, and more than one site can be treated at the same time. Patients are comfortable during treatments, and more likely to complete a series of treatments in order to benefit from the accumulative effects of light. Patients can be treated with contraindications for other modalities, such as circulation and nerve impairments, pacemakers and joint implants. All MedX Photo therapy low level laser and SLD based devices have the following indications of use by FDA: "...the energy emitted provides temporary increase in micro-circulation, temporary relief of minor muscle and join aches, pains and stiffness, relaxation of muscles; for muscle spasms, minor pain and stiffness associated with arthritis." The compact MedX Console powers the MedX low level laser and superluminous diode accessories. It is easy to use - built-in guidelines prompt you through decisions related to selection of parameters, then automatically calculate and display treatment times. Alternatively, if the treatment parameters are known, the manual mode allows for quick, easy setup. Three accessory ports provide the flexibility to use any combination of accessories with either continuous or pulsed mode. 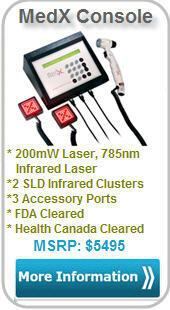 MedX accessories include a hand-held low level laser and a hands-free super luminous diodes (SLD) cluster. Once activated, the console displays the time and energy delivered for each port separately and automatically turns itself off once treatment is completed. Multiple sites can be treated at the same time. For Smoking Cessation and other Addiction and Auricular Acupuncture Programs - The MedX Laser Probe with its unique fiber optic light guides deliver precise laser stimulation for auricular and body acupuncture. These protocols require point treatment for numerous locations within the ear and body. For rehabilitation and sports medicine applications the larger fiber optic light guides provide point treatment with a single diode probe rather than treating a larger area with a laser cluster. The Laser Probe delivers the energy to deeper more specific target tissue, such as joints or muscle insertions. 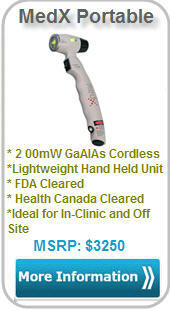 MedX Tethered Laser Probe has a sleek, ergonomic design for ease of use. The Laser Probe delivers 200 mW of infrared energy from a single 808 nm GaAlAs laser diode with a visible red guide light. The tethered device is powered and controlled by the MedX Console which is fast and easy to set-up. The large area superluminous diodes (SLD) cluster provides energy with a combination of predominantly infrared (870 nm) and visible red (633nm) diodes to provide an even distribution of light energy over the entire area. Two clusters can be strapped-on for hands free application, allowing unattended treatment. While treatment is being provided the console displays the remaining time and energy delivered. Once treatment has been completed the clusters are automatically turned off. All MedX products are built in Canada at an ISO 9001: 2000 and ISO 13485: 2003 certified manufacturing and testing facility.